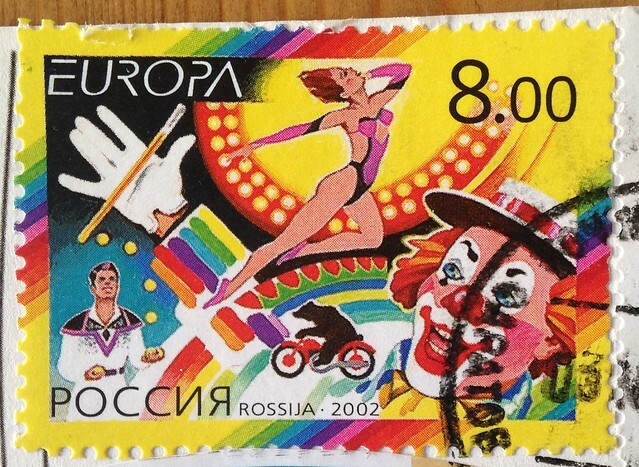 I recently received this spectacular stamp on a Postcrossing postcard from Russia. 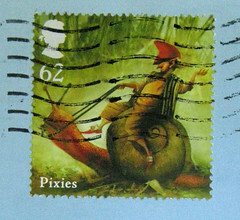 The postcard was less memorable, but that stamp is a keeper. I know lots of folks are creeped out by clowns, and this one hardly looks harmless, but somehow the combination of excessive rainbows makes it an absolute winner. And the bear on the bike? Priceless! One of my favorite things about Postcrossing is receiving these fascinating postage stamps from all over the world; in many cases, the stamps are a lot more interesting than the postcards!